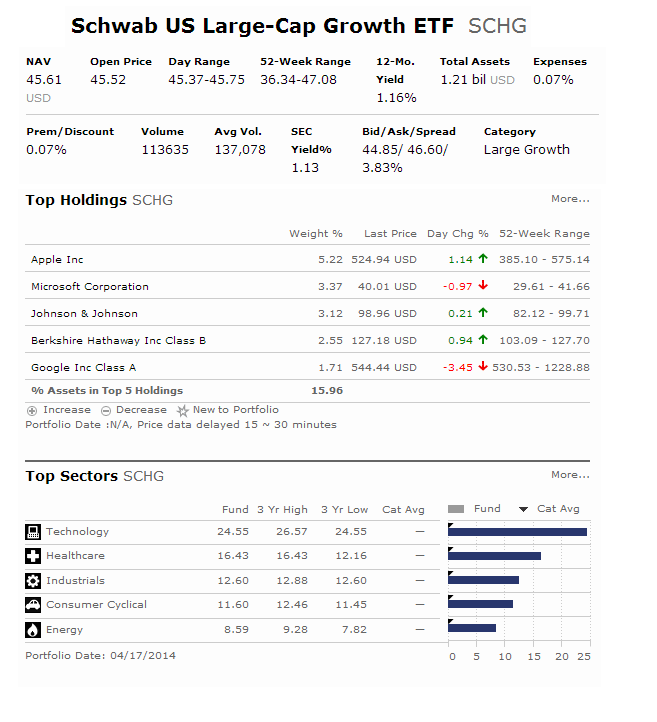 Find top large growth ETFs in 2014 review. These large growth ETFs are investing in big U.S. companies with high growth potential. Large growth funds are popular among investors. These funds invest in large U.S. companies that tend to grow faster than other large cap stocks. These funds are focusing on companies in rapidly expanding industries in term of earning, sales, book value, and cash flow. These companies also provide little to no dividend yield and have high price ratios. Investing in large growth exchange traded funds can diversify your portfolio. Whether it is for your brokerage or retirement account, you can fit these ETFs in your core investment portfolio. These best large growth ETFs in 2014 are sorted based on its year to date performance in 2014. You can find the fund details and review below. Some of these ETFs can be bought for free from variety of brokerages such as Fidelity, Schwab, TD Ameritrade, and Vanguard. PowerShares Fundamental Pure Large Growth Portfolio is an index ETF that is tracking the RAFI Fundamental Large Growth Index. This index consists of common stocks of "large growth" U.S. companies, including real estate investment trusts (REITs). The current dividend yield is 0.82%. The ETF market price is $29.05. Its expense ratio is 0.79%. Top 5 stocks in its holdings are Microsoft Corporation, Wells Fargo & Co, Apple Inc, Merck &Co In, and Coca-Cola Co. Top 3 industry sectors are technology, healthcare, and energy. Guggenheim S&P 500 Pure Growth ETF has $1.3 billion of assets. This best ETF has a low expense ratio fee of 0.35%. The current NAV price is $71.83. The 52 week price range is between $54.03 & $76.40. Morningstar has ranked this stock exchange traded fund with 5 stars rating. As one of the top large growth ETFs in 2014, this index ETF has a YTD return of 2.28% in 2014. It has returned 16.47% over the past 3 year and 24.88% over the past 5 year. Top 3 stocks in its assets are Huntington Bancshares Inc, Safeway Inc, and TripAdvisor Inc.
Schwab US Large-Cap Growth ETF is one of top stock ETFs with low expense fee. The expense is only 0.07% per year. This ETF invest mainly in the faster-growing half of the U.S. large-cap market. This large growth fund also has a yield of 1.16%. 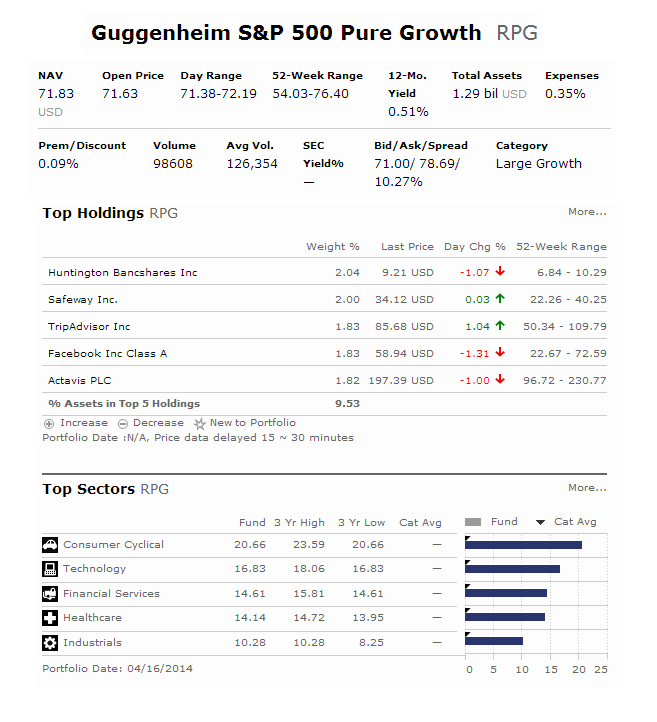 Ranked with 4 stars rating, this top large growth fund has a 3 year annualized return of 14.52%. In 2014, the year-to-date return is 1.30%. Top 4 stocks in its portfolio are Apple Inc, Microsoft Corporation, Johnson & Johnson, and Berkshire Hathaway Inc.
Vanguard S&P 500 Growth Index ETF is also another 4 stars rated fund. This ETF by Vanguard Group has total net assets of $239 million. The expense ratio fee is 0.15%. The average 3 year return is 15.02%. In 2014, the YTD return is 0.63%.